Mr Thomas said Labour's gains were a "breakthrough"
The Tories held on to power in councils across Hampshire during an election that brought some mixed local results. They kept control of the New Forest, East Hampshire, Rushmoor, Havant, Winchester, Test Valley and Basingstoke and Deane councils. Lib Dems consolidated their strength in Eastleigh while Portsmouth and Hart councils stayed in no overall control. In Southampton, the Lib Dems lost four seats, which were divided between Labour and the Tories. The two parties will now vie for power. Southampton Labour councillor Don Thomas said: "It has taken many years of hard work for the Labour party to make that breakthrough." 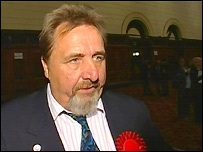 In Portsmouth, Lib Dem council leader Gerald Vernon-Jackson said he was "delighted" by his party's performance. The only defeat for the party in the city was in Central Southsea where Debbie Tomes, the city's executive member for children and young people's services lost her seat. The Tories held Rushmoor with 28 councillors - taking two seats from the Lib Dems, who gained three seats in Eastleigh. Test Valley will have two extra Conservative councillors, up to 33, with the Liberal Democrats losing two, down to 15. Basingstoke and Deane remains exactly the same with the Conservatives returning 31 councillors, Lib Dems 15 and Labour 11.